After more than two decades of contributing with his voice and songwriting on studio albums, it's finally time for APOLLOto deliver his first solo album. And it's been a long road leading to "Waterdevils". Apollo's career started at the age of 14 when the young Apostolos from Swedish town Borås, inspired by bands like Kiss and Alice Cooper, started playing with various bands, as an aspiring guitarist. "Not many wanted to be vocalists back in those days. Everybody wanted to play the guitar, nobody wanted to sing. So I just decided to become a singer." Apollo joined his first bands Blazon and Craze at the age of 17. Craze released a single "Living In Sin" but the band disbanded shortly thereafter when Apollo left to do his military service in 1988. It took another eight years before Apollo recorded his first full album with the band Faith Taboo. "We started out as a cover band, but I didn't want to waste time just playing other people's songs, so I had everybody get involved in writing songs for our self-financed album "Psycopath" [released in 1996]. The band played local gigs for a while, until they eventually called it a day and Apollo joined the bandMajestic. His singing career took off and he sang with bands and projects in a neverending stream: Time Requiem, Meduza, Sandalinas, and Evil Masquerade to mention but a few. But things were about to really start happening in 2006. Time Requiem were mixing their album in Studio Fredman in Gothenburg in late 2005, when studio owner and producer Fredrik Nordström introduced Apollo to a guitarist who was also working in his studio. Ã¢â‚¬Å“Fredrik said he wanted me to meet this Greek guy, Gus. He thought we would get along, cause we were both Greek. It clicked right away. Gus asked me to join his band Firewind, but I had to turn down the offer because I was studying at the time and didn't have time for another band. He asked again about six months later, and by that time I was done with my studies so we went for it. It was magic, it felt like it was finally the real deal and we were all on the same musical level." The Firewind-guitarist was Gus G - who in 2009 landed the dream job as the lead guitarist in Ozzy Osbourne's band, replacing Zakk Wylde. The years with Firewind definitely and finally put Apollo on the map. He recorded 4 albums with the band and toured with the likes of Y&T, Scorpions, Judas Priest and Whitesnake among others, playing big festivals such as Download, Graspop Metal Meeting, Sweden Rock Festival and more. Apollo parted company with Firewind in January 2013 and decided to focus on Spiritual Beggars (w. guitarist Michael Amott, Arch Enemy) who he had joined in 2010 and fronted alongside of Firewind. He also started working on his solo debut. The coming two years were spent writing, recording and collaborating with friends from bands like King Diamond, Helloween, Gamma Ray, Arch Enemy, Grand Magus, Metalium, MasterPlan and many more. "I originally wanted to release the material under a band name or as a project, but people kept saying it was about time that I go solo and step out as a solo artist. So I decided to take the plunge." 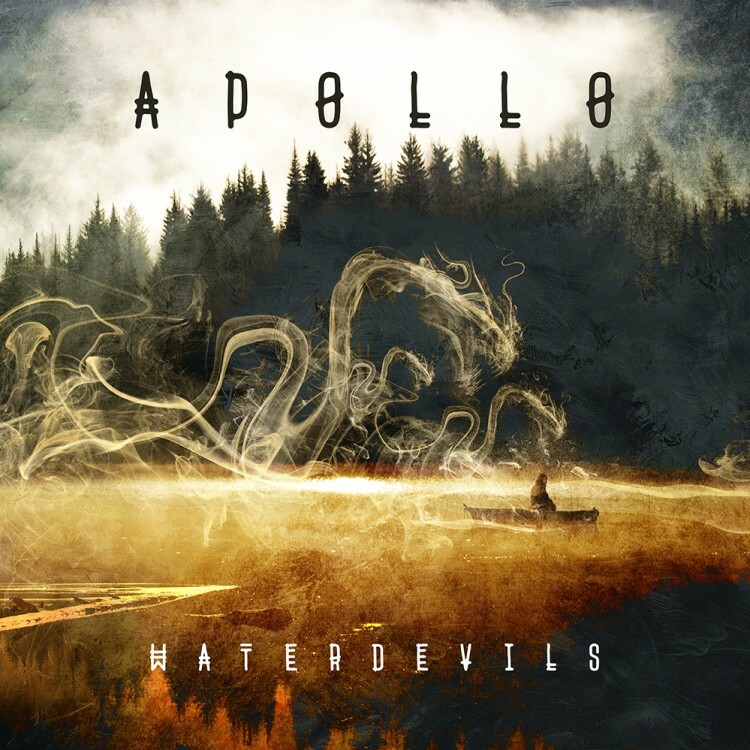 "Waterdevils" is the result of Apollo's free musical spirit where he has liberated himself from all rules and just done whatever he wanted to do. "I wanted to do this because it's fun and exciting, and also because I want to contribute to keeping classic rock alive!" "Waterdevils is a weather phenomenon. It's a small, weak whirlwind over water that's pretty rare. You never know where you'll see it or if you'll see it again. In a way it's a tribute to all of those who have contributed to this album. They showed up, unexpectedly and they might show up again, or maybe not, you just never know. Like waterdevils."